I have a new short story out in the Fireside Fiction Quarterly! They have an amazing selection of short fiction available online, but my story, "By the Storytelling Fire" is only available in the print quarterly, which you can get by subscribing to them for just $10 a month! You can also get it by buying it as a $5 back issue; I'm in Issue 63. "By the Storytelling Fire" is about two people telling each other fairytales that may or may not be about themselves. One is a remix of Sleeping Beauty, examining consent that is not given in the original tale; the other is a tale of an illegitimate prince who rejects toxic masculinity. I wrote this for my final week of Clarion 2016, and I'm so glad it's out in the world! I hope you like it! It's a new year, and I've got new fiction coming up! 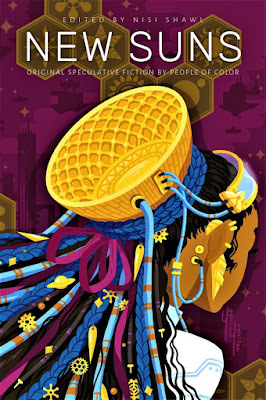 I'll be in New Suns: Original Speculative Fiction by People of Color, edited by the inimitable Nisi Shawl! It'll be published by Solaris Books in March! My latest short story, "A Field of Sapphires and Sunshine," is now out in GLASS AND GARDEN: SOLARPUNK SUMMERS from World Weaver Press! If solar-powered airships, crocodile farms, and happily-meddling family members sound like your jam, buy the book and support the anthology! I'm also participating in a series of blog posts at the World Weaver Press blog! So watch that space for me! New fiction! "When The Bough Breaks"
Mythic Delirium 4.3 is now live! I'm honoured to be the featured story for January 2018, kicking off this Gregorian year on a good note, even if the story itself is quite dark. "When the Bough Breaks" combines different things I learned in childhood--rhymes and stories of forest spirits--with the memory of the Highland Towers collapse in 1993. Parts of the plot were also directly inspired by dreams I had during a brief period when I kept sleeping wonky, waking myself up with pins and needles in my back. I'm not used to writing horror, and it is indeed one of my least read genres: when it comes to good horror, I scare easily. Growing up in Malaysia we have a lot of ghost stories and a laundry list of ways to not piss off forest spirits, and our spirits tend to be less jump-scare and more ambient creepiness, so I thought I would try my hand at it.